#yearofthedesktop is a long running joke in FLOSS communities. When will Linux be more popular than Windows on the Desktop? (please hold back your laughter until the end). Let me explain why this is the Year of the Desktop, and why community developed software will win (and in fact has already). I'm pretty sure all the examples are now working with SDL2/pygame 2. New SDL2 functionality. Also we have some new SDL2 functionality exposed (experimentally, the APIs are not done yet). Multitouch, and AudioDevice, along with an example of recording audio. @dlon has been fixing a number of bugs(implementing key repeat, fixing unicode issues) and also prototyped some Window/Renderer classes (using ctypes and python). The new events are done in a backwards compatible way, so that games using them with pygame 1/SDL1 will still work. You just won't get the events. Here's a pretty simple example of using the Flask microweb framework, and matplotlib together. Matplotlib is a graphing library used by a lot of people in python. But how to serve your graphs up in a web browser as a png or an SVG image? 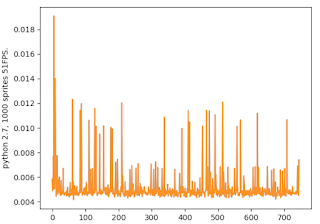 Code is in this gist: flask matplotlib. 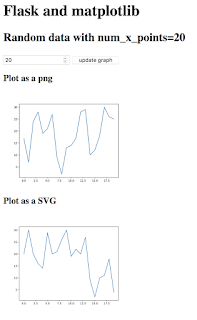 Serving svg and png images with Flask and matplotlib.